By Sam Smith | 2.6.2016 | 1:05 p.m.
Who had Derrick Rose in the pool for the only healthy Bulls current or former All-Star in February? Joakim Noah was lost for the season with shoulder surgery last month. Pau Gasol sustained a hand injury in the Wednesday victory in Sacramento and was out for Friday’s game in Denver. After scoring 19 points in a Bulls 57-55 halftime lead, Jimmy Butler came down awkwardly on his left leg with about a minute left in the first half and sustained a sprained knee. He didn’t return, will have an MRI Saturday and coach Fred Hoiberg said the team has to accept Butler could be out. The Bulls Big Three was minus two, and it was almost enough for one night with just Rose. Almost, but not quite. Rose scored 30 points and added team highs of nine rebounds and eight assists, but in the end the Nuggets roared back from an 18-point late third quarter deficit, finally got the lead with 51.2 seconds left and negated a brave and determined Bulls effort with a 115-110 Nuggets victory. The Bulls fell to 27-22 and sixth in the bunched Eastern Conference. The Bulls are tied in losses for third, but just a game and a half out of eighth. Now 2-3 on this long road trip, the Bulls could return in the last playoff spot in the conference with games Saturday in Minnesota and Monday in Charlotte. But all of that is minor compared to the scene at the end of the second quarter when Nuggets reserve center Joffrey Lauvergne knocked Butler to the floor on a drive as Butler with drive after drive was pushing the Bulls ahead after a 30-26 first quarter deficit. Butler landed hard on his left leg with it stiff and stayed down. He hobbled to his feet after several minutes as medical personnel brought out a wheelchair cart. Butler was helped to the free throw line by Taj Gibson to shoot his free throws. If a player cannot finish his free throws someone else would shoot and he would be out for the game. Though it seemed clear Butler was not about to return. Still, with an MRI Saturday morning in Minneapolis and Butler with enough problems in the same knee that he had to miss Wednesday’s game, it would seem like he and the team may have to take a step back, also because Butler leads the NBA in minutes per game. “The early diagnosis is it’s a sprain,” said Bulls coach Fred Hoiberg. “The knee seems in tact. The ligament seems stable. He’ll get an MRI and we’ll know more after that. When the weary Bulls on the second of a back to back face another rested, young, athletic team in the Minnesota Timberwolves. It would have been a relief to come in with a victory, and it almost was one of the more impressive wins of the season without two starters, reserve Cameron Bairstow starting for Gasol and a series of unusual lineups even featuring Cristiano Felicio and an 89-71 Bulls late third quarter lead. But two Aaron Brooks turnovers to start the fourth quarter were crucial as the Nuggets got a pair of quick scores and were off and running and running and running. 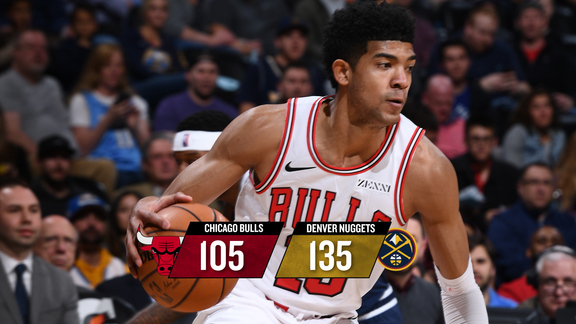 The Nuggets led by Gallinari with 33 points and rookie Emmanuel Mudiay with 22 hit the Bulls with a 16-6 run to start the fourth quarter to make it a contest down the stretch. 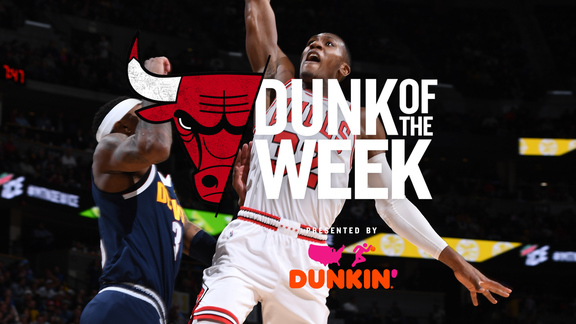 Rose was doing all he could to hold them off with some timely baskets from Doug McDermott, who had 15 points and three of four three pointers. Rose’s runner and three-point play with 3:51 left gave the Bulls a 105-101 lead. The Bulls would hang in until the last minute. The usually poor shooting Mudiay, who was five of 11 on free throws, then made a three and Kenneth Faried tied it at 105 with one of two free throws with 2:56 left. Bairstow then made his only field goal with 2:42 left on a 16 footer after a drive and kick out from Rose. The Nuggets were giving the Bulls chances as Faried missed two more free throws. The Nuggets were pounding the Bulls on the backboards much of the game without Gasol and especially in rim protection as Denver players were in a conga line to the basket with just the smaller Gibson, who did have 18 points with some power moves inside, Bairstow and Bobby Portis. Nikola Mirotic remains out after appendix surgery. Gibson made one of two free throws with 1:41 left for a 108-105 Bulls lead, but Mudiay drove past the staggering Bulls defense for a score and missed another free throw: 108-107 Bulls with 1:31 left. Everyone was collapsing toward Rose now as he missed an open 10 footer. Gallinari gave the Nuggets their first second half lead with 51.2 seconds left, Rose missed again and Denver just piled it on with more free throws in the last minute. “It hurts but it’s on to the next game,” said Rose with his second 30-point game of the season as he sliced and diced the Denver defenders with daring and elan. “When we got the lead we couldn’t stop them from coming back and making a run. We didn’t play the way we were supposed to and let them score 42 points in the fourth quarter. Perhaps better than the rest of the players, dragging in after what seemed like yet another turning point moment that became a discouraging defeat. “We did some really good things to get that lead,” said Hoiberg. “We went out in that third quarter not knowing the prognosis on Jimmy and really battled, in complete attack mode, took over the momentum of the game. And then we gave it right back. We lost that attack, lost what got us the lead.